Mid King Biv in the Tararua Range. On Tuesday a request went out asking for people to point out “loopy rules and regulations”. I ignored it at first, with the politics involved, but soon after Federated Mountain Clubs asked via its Facebook page if this could be applied to some of DoC’s practices with signs in the back-country, especially safety signs. I’ve written about the saturation of the back-country with safety signs previously, especially when writing about the Cave Creek Accident of 1995. 14 people died and 4 were seriously injured when a poorly constructed viewing platform collapsed. Many contributing factors were identified, but an underlying theme was that the 8 year old Department of Conservation had never been structured into a coherently functioning entity in many critical respects. This had contributed to design, approval and construction of the completely inadequate viewing platform by people who very possibly weren’t qualified to know that they didn’t know enough about what they were doing, or who had reason to assume that someone other than themselves was in charge. One consequence of the accident and follow-up investigations was a complete shake-up of DOC. In many ways, the outcome of the inquiry has helped to shape the modern back-country experience in New Zealand. An aspect of this shape which was noticed by users of the back-country in the years which followed was the sudden proliferation of signs. The above photo demonstrates one of the more extreme cases of this standardisation. Mid King Biv in the Tararua Range is a 2 person shelter, in which it’s impossible to stand up. There’s a single door, which includes a giant FIRE EXIT sign. DOC’s other standard hut signs are also present. The standard DANGER sign warns about proper ventilation when cooking with gas, and another standard sign strongly warns naive visitors that the provided water is probably fine but visitors can choose to treat it if they want to. To rub it in, the “provided” water at Mid King Biv has nothing to do with the hut, and comes from a natural alpine stream nearby. DOC’s standard Environmental Care Code sign is also present, but the limited space in the biv for posting signs seems to have resulted in the FIRE EXIT sign being attached directly over the top of it. Back to the original question, FMC’s facebook post reminded me about this issue, and I checked further. If any of this is to be addressed then I guess the actual standards or rule-books which result in all these signs need to be identified, and maybe then it’ll be easier to identify why they’re considered to be so important to be in every New Zealand back-country hut. I haven’t been able to find it all, and maybe it’s not all published in public, but DOC’s internal rules for building back-country huts are embodied in the Hut Procurement Manual for Backcountry Huts which is available online. Interestingly enough, only two of the above signs seem to be required by the Hut Procurement Manual. For one of these DOC doesn’t even seem to be following its own specification. Part D of the manual is devoted to Fire Safety. Within part D, it’s section 2.2.5 which describes the specifications for signs, and rule 2.2.5 requires that signs read “EXIT” rather than the “FIRE EXIT” signs which seem to be most frequent. The manual also only requires EXIT signs to be placed above exits which are not the main exit, and so the FIRE EXIT sign on the main (and only) door of Mid King Biv isn’t required at all, at least according to the Hut Procurement Manual. Even if it was required, it would need to be above the door (probably not actually possible), instead of on the door. If DOC commissioned a new Mid King Biv, it would probably have enough space between the top of the fire exit and ceiling to fit a big, reflective sign. The only other sign requirement I can find in the Hut Procurement Manual is that for warning users of a “potential hazard” with drinking water. It’s in part E (Construction), section 3.4, and a warning sign must be provided even if no water is supplied. 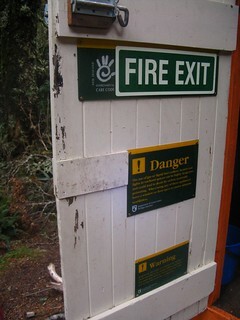 This is why so many of New Zealand’s back-country huts, which are located next to remote mountain streams, are plastered with WARNING signs which then go on to suggest the water’s probably safe but give permission to treat it if doing so helps you to feel better about yourself. I can’t find published requirements within the Hut Procurement Manual for the other regular signs, like the dangers of un-ventilated gas cooking, or those which tell people to be nice to the environment. These signs might just be a case of DOC trying to be helpful, but it seems a very standardised and consistent way of being helpful for something that’s not in the documentation. If anyone out there knows of further documentation, maybe also about all those person-limit signs on every bridge, I’m curious to know. It is mostly out of curiosity, since I don’t think I can be bothered doing anything. If the sign thing is to be reviewed some day then I’d prefer it were done for the right reasons than made into a pre-election political stunt. One last point to ponder: The Cave Creek Commission of Inquiry found that a sign which had been ordered (restricting numbers on the platform), but which had never reached the site, might have prevented the platform collapse on the day. It also found that the structure should still always have been constructed to withstand as many people as could have been reasonably been expected to crowd onto it, irrespective of any stated limitation. While a sign might have prevented that tragedy, it would never have stopped the platform from being a serious tragedy waiting to happen. Sometimes I wonder where this warning sign mentality has come from. This entry was posted in musing and tagged department of conservation, federated mountain clubs, government policies, huts, musing. Bookmark the permalink.